The term ‘essential’ is thrown around more than dice on the Las Vegas strip. You only have to look at the fact that there’s an album called Bon Jovi: The Essentials for evidence of that. However, one piece to which the term has been correctly applied for more than 120 years is the Oxford shirt. Sitting alongside a well-fitting navy suit, a selection of white T-shirts and selvedge denim in the menswear hall of fame, the OCBD (that’s ‘Oxford cloth button-down’ to the uninitiated) is one of the few key sartorial building blocks guaranteed never to fall from favour. Bought in classic shades of sky blue, pink and white, an Oxford shirt has the ability to add a casual lean to an otherwise formal outfit or dress up a relaxed chinos and sneakers combination. It’s no overstatement to say that the OCBD is as near as you’ll get to the ultimate wardrobe cornerstone. But in case you needed further convincing, here’s everything you need to know about this menswear essential. Softer in its construction than a stiff dress shirt, and a tad more formal than your weekend flannel, the Oxford shirt is a solid, fail-safe option when you’re attempting to bridge the treacherous gap dividing smart and casual. While the merits of owning an OCBD (or five) may come as no surprise, what might is that this staple has little to do with the English city with which it shares its name. In fact, the moniker is taken from the fact that it’s made exclusively from a thick, woven fabric known as Oxford cloth. Despite often being referred to as an Oxford cloth button-down, not all are finished with a collar that fastens to the shirt. Those that do are inherently more casual, but smarter styles (most of which use collar stays to maintain their shape) still qualify as Oxford shirts if they’re cut from the right cloth. The Oxford shirt can be traced back to 19th century Scotland, where local mills were experimenting with different weaves and producing original fabrics. Four of these new types of cloth were named after the most prestigious universities of the day: Yale, Harvard, Cambridge and Oxford. While the other three have since faded into sartorial obscurity, Oxford cloth has stood the test of time. This is thanks in no small part to Brooks Brothers, the oldest men’s clothing brand in the US. In 1896, John E. Brooks noticed how English polo players pinned their collars down to keep them from flapping up during matches. Inspired by this, Brooks set about developing a shirt that used buttons to carry out the same task. The result was the Oxford shirt as we know it today and the end of the previous practice of men buying their shirts and collars separately. However, it didn’t take long for the OCBD to gallop off the playing field, no doubt due to the fact that it looked equally at home paired with a tie and jacket as it did on horseback. From there on out, the Oxford shirt never went away – and given what a versatile piece of kit it is, it’s unlikely that it ever will. Why Do You Need An Oxford Shirt? In a word: versatility. The Oxford shirt has an unparalleled ability to blend into any setting and as part of almost any dress code. You could just as easily wear one to a formal event as you could down the pub. There aren’t many items of clothing you can say that about. Whether you’re suiting up for a work meeting or cobbling together a casual outfit for the weekend, getting dressed is made infinitely easier with a selection of Oxford shirts to hand. To give you a friendly nudge in the right direction, we asked stylist Sarah Gilfillan from personal shopping service Sartoria Lab to recommend four fail-safe ways to wear your OCBD, whatever the occasion. Oxford cloth may not be as fancy as poplin or pique weaves commonly used on dress shirts, but it can still be worn with a suit if you know how to get it right. Understandably, business and casual aren’t two words that have always gone together, but as office dress codes continue to relax, their pairing is becoming increasingly common. For day-to-day duties, smart casual is the only way to go. Helpfully, the often tricky to dress for code is pretty much what the Oxford shirt was made for. Dressing for downtime doesn’t always have to mean reverting to the same faithful hoodie or pizza-stained T-shirt. Instantly elevate your weekend attire by opting for a button-down in place of a sweat and earn yourself some off-duty style points in the process. When it comes to the cornerstones of the male wardrobe, pale imitations are rarely a patch on the real deal. To make sure that your Oxford is (literally) cut from the right cloth, take note of these tips when searching for the perfect shirt. While it might be impossible to visually distinguish between an Oxford shirt crafted from cotton and one blended with manmade fibres such as polyester, you’ll only get a comfortable, breathable and long-lasting wear from the former. Pure cotton Oxford shirts also offer a more pleasant hand feel, and will fare far better at keeping you cool in warmer temperatures. Depending on who you ask, different menswear experts will suggest a different starting point for your collection of Oxford shirts. Yet all agree on the holy trinity of colourways every man should own: sky blue, white and pink. This applies whether your Oxford is uniform in colour or striped. The enduring appeal of the Oxford shirt is its ability to be an everyman, which applies to fit as well as formality. Seek out designs that neatly follow your form without straining over your frame, looking out in particular for a box pleat (a rectangular fold of fabric that runs along the middle of the back) on the reverse for an increased range of movement. Menswear purists will say that an Oxford shirt should feature a roll collar (where the lack of interlining causes the collar to rest in a curved shape) but straight collars (which, as you guessed, rest flat) offer a slightly cleaner finish. Oxford shirts without button-down collars, but still cut from the correct cloth, are usually reserved for formal outfits. As with any other area of the male wardrobe, the devil is in the detail. Play to the Oxford shirt’s casual heritage by avoiding tricky French cuffs in favour of standard button cuffs. As for the fastenings themselves, mother-of-pearl sets the bar because it gives a depth of colour and is more resistant to cracking. High-street outfitter Uniqlo is well-known for turning out quality wardrobe basics at wallet-friendly prices, and Oxford shirts are one of the things it does best. Quality cotton, tasteful colours, a flattering fit and all this for less than half what most traditional brands cost. If that’s not worth braving the high street for, we’re not sure what is. The OG of the OCBD, Oxford shirt inventors Brooks Brothers was founded in Manhattan over two centuries ago, making it the oldest continually trading men’s outfitter in the US. The firm released its iconic Polo Button-Down Oxford shirt in 1896, and in the process created a key building block in many a stylish man’s wardrobe. As the high street’s go-to spot for simple American classics, it stands to reason that Gap has an extensive collection of Oxford shirts. Expect soft, casual cotton, cut slim but not too slim, deployed across short- and long-sleeved versions in a wide range of colours, stripes and checks. It’s impossible to think of an Oxford shirt without preppy, Ivy-League style springing to mind. And you can’t think preppy, Ivy-League style without ending up at Ralph Lauren. The New York label has made the look its calling card since 1967, and its fitted, flattering Oxford options are some of the best around. The mod movement of the 1960s was one of the contributing factors that helped thrust the Oxford shirt into the mainstream, and it was Ben Sherman leading the charge. Shirts by the British label have been passed from subculture to subculture, becoming iconic in the process. If you like your clothes to come with a story, it doesn’t get much better than this. Headquartered in Stockholm but with roots in preppy Americana, Gant is often cited as the brand that brought button-down shirts to the mass market. It’s also credited for inventing the hanger loop – another key casual shirt detail that was quickly adopted elsewhere. While timeless, the clever detailing and modern twists on Gant’s products keep things moving forward. For a quality Oxford shirt from one of the originators, look no further. It should come as no great surprise that the old reliable of British department stores is well-stocked on the old reliable of men’s smart-casual dress codes. With a strong offering from its in-house label, as well plenty of recognisable names, the retailer is bound to have an Oxford shirt that fits your wardrobe. One of America’s finest examples of classic, preppy style done well, J.Crew has become synonymous with easy-to-wear, modern wardrobe staples. The brand’s approach has earned it legions of followers worldwide and its neatly fitted Oxfords are just one of the things that keep style-savvy shoppers coming back. With a shopfront on Jermyn Street – the capital of British shirtmaking – Emma Willis creates some of the finest bespoke and ready-to-wear Oxfords on the face of the earth. You’ll not see any fleeting trends among the shelves here – the focus is solely on traditional, all-English styles. So if you like the idea of timelessness, quality materials and craftsmanship, Willis is most certainly the woman to see. Copenhagen-based label NN07 bills its products as the classics of tomorrow, and having kept a beady eye on its collections since 2007, we’d be inclined to agree. The focus here is on simple wardrobe staples, an approach evident in its Oxford shirts, which feature a tidy slim-fit profile cut from resilient, wrinkle-resistant cotton. One of the most reliable names on the high street for almost half a century, Topman is a safe bet for more or less every component of the male wardrobe. 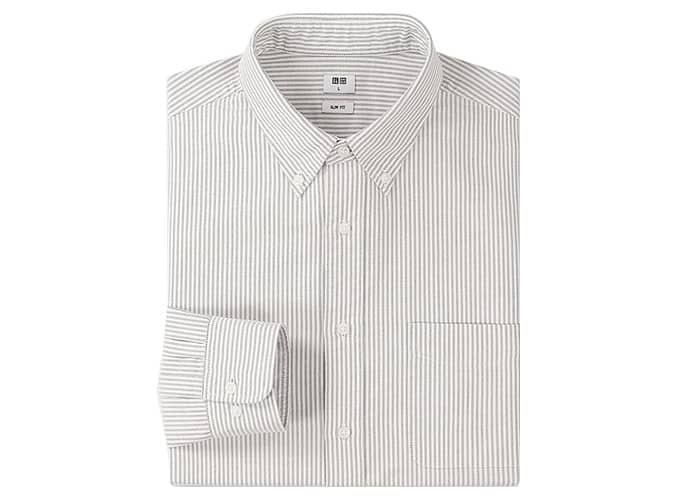 The retailer’s contemporary line-up of Oxford shirts is no different and includes options in bicep-hugging muscle-fit cuts. Because even swole bros need to look smart. Jean Touitou’s French label has carved out a niche as the premier provider of minimalist, Parisian chic. A.P.C. pays little attention to trends, instead focusing its attention on a level of quality that is second to none. The Oxford button-down has long been one of the label’s key items, making A.P.C. the perfect place to pick one up.